The development of high-throughput screening for protein-protein interaction (PPI) is currently utilized for detailed experimentation and the formulation of biological hypotheses. Comprehensive and concrete PPI networks of domestic animals are urgently needed because of their considerable economic value. 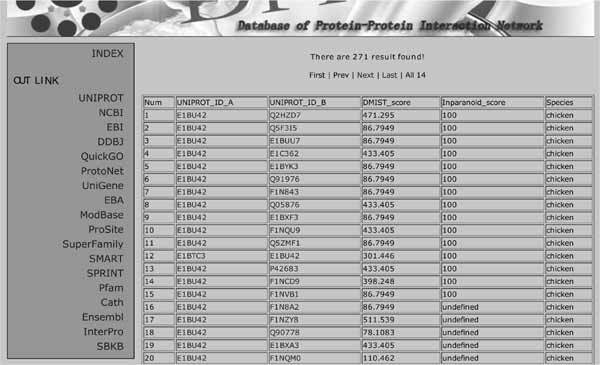 We constructed the PPI networks of chickens, cattle, dogs, horses, and rabbits using the InParanoid method, an interolog method that depends on protein ortholog algorithms, and the domain-motif interactions from structural topology (D-MIST) method which is defined as if a motif in protein A matches a domain in protein B in the position-specific scoring matrices, protein A likely interacts with protein B. Up to 328,590 PPIs were found in chickens, 447,014 in cattle, 129,386 in dogs, 93,414 in horses and 115,296 in rabbits. Furthermore, a large number of novel PPIs with diverse biological roles were discovered. Gene ontology annotation and subcellular localization were applied to verify the results. In GO annotations, 30.28% to 50.08% and 35.32% to 39.97% of the predicted PPIs were found sharing GO terms using Inparanoid and D-MIST. In subcellular localization, 55.04% to 59.97% and 35.43% to 40.26% of the predicted PPIs had the same subcellular localization using Inparanoid and D-MIST. Compared with the randomized networks, the results revealed the predicted networks were considerably reliable. This work, to some extent establishes the biological significance of these PPI networks and provides clues to further decipher the molecular mechanism of circadian rhythmicity. The PPI networks of the five species are freely available at http: //dppin.songbx.me. D-MIST, Gene ontology annotations, InParanoid, protein-protein interaction, subcellular localization. College of Life Science, Center for Bioinformatics, Northwest A & F University, Yangling 712100, Xi'an City, Shaanxi Province, P.R.China.